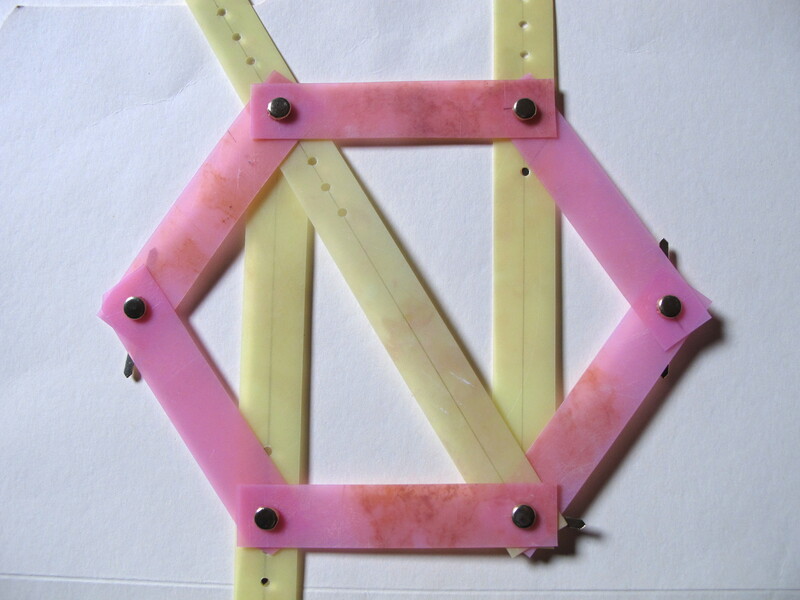 Build simple shapes (triangle, hexagon etc) from plastic strips and brads. Test and record how stable each of the shapes are. Tabulate class results to determine which shape is most stable. 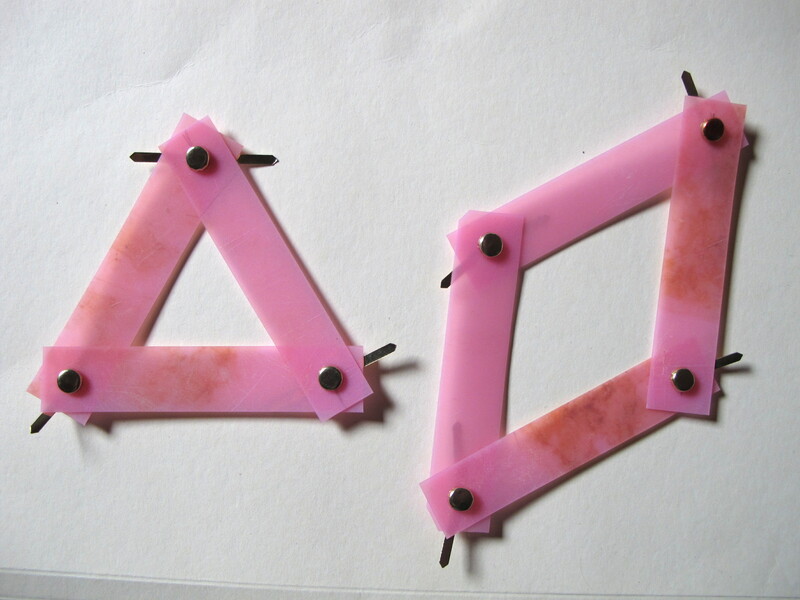 Add struts to the various shapes to divide them into triangles and make them more stable. Note on preparing the plastic strips: the plastic strips should be made from sturdy, flexible plastic sheets, such as a portfolio cover, plastic place mat, or thin plastic chopping board. They can be sliced with a paper cutter. Punch the holes with a small hole punch with a 3mm diameter (the holes of larger hole punches will allow too much wiggle in the shapes). It will take a while to make a class set. Strips could also be made form thick paper, but they will not last as long. Show students an image of a local bridge with a visible frame, and ask if they have seen or been over this bridge, or one like it. Tell them that the frame is strong and keeps the bridge rigid, even with the force of all the cars and trucks driving over it. Show students an image of a frame of a house, and ask if they have seen anything like this on a construction site in their neighborhood. Tell them that behind the walls and under the roof of every building there is a frame like this one that supports the weight of the building and everything in it. Point out the steel/wooden beams that make up the frame of the bridge/house. Tell students that these beams are fastened together in shapes that are strong, which can distribute and balance the forces on the structures, so that they do not fall down. 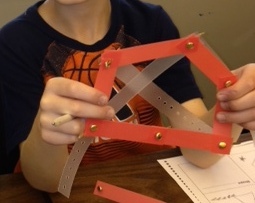 Explain to the students that they will be building their own regular polygons, from rods and fasteners, and testing them for strength, to find out which shapes are the sturdiest. 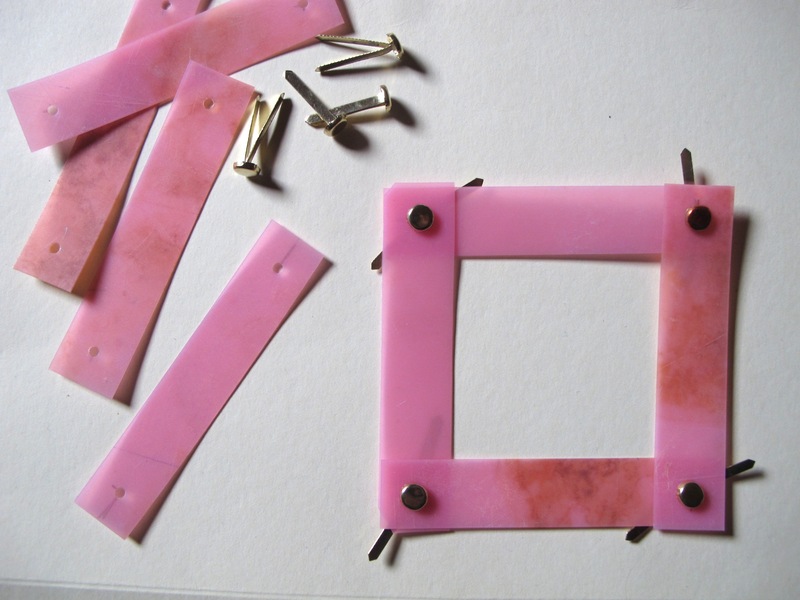 Show the students the rods and fasteners that they will work with (the short plastic strips and the brads), and demonstrate how to fasten the plastic strips together to make the outside of a shape (see photo 1), with three or more sides. Then demonstrate how to test the strength of their shape by laying a square on the table and gently pushing it from one side (see photo 2). 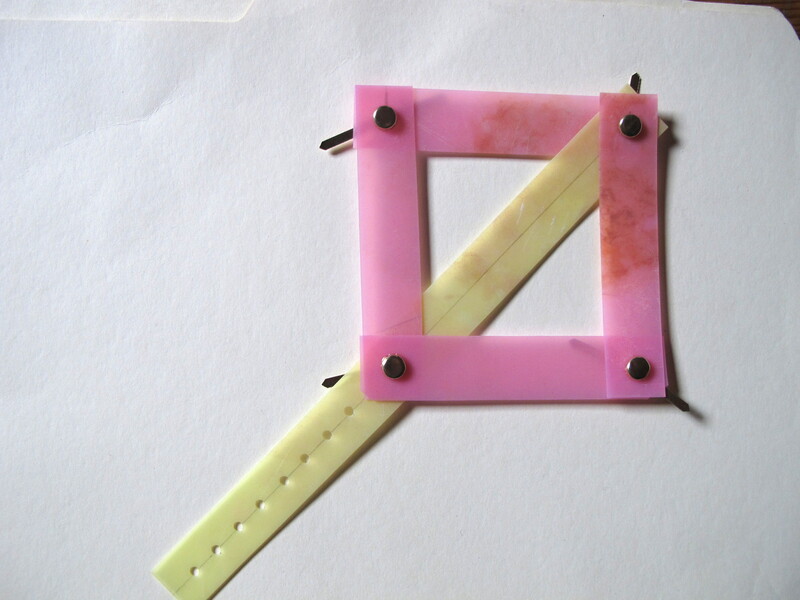 Distribute kits containing eight short plastic strips and eight brads to each student pair. Distribute one worksheet (attached below) to each student. Students are instructed to make a triangle, a square, then any other simple polygons they like. The shapes should be a simple outline of a shape, with no cross bracing. 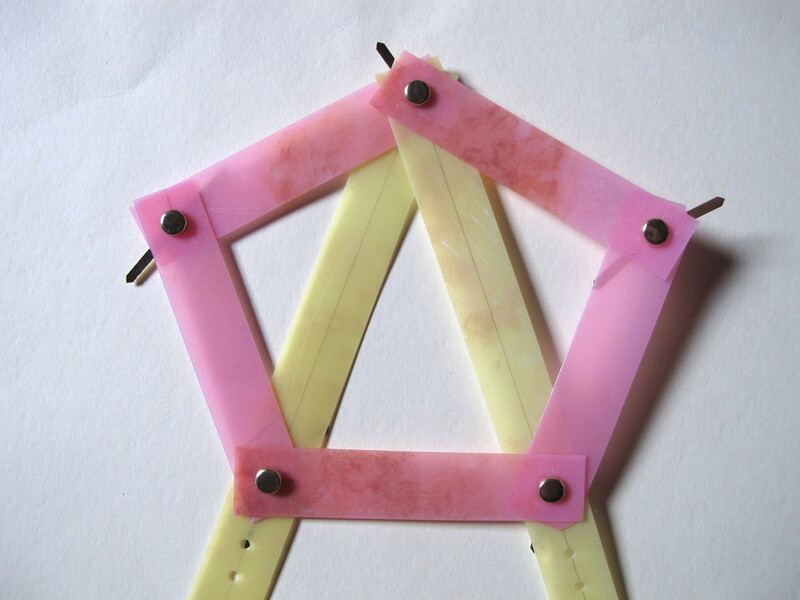 (Students will be able to build up to an eight-sided octahedron with their kit.) Students should draw each shape in a box on their worksheet, name it if they can, and record the number of sides. After testing it for strength, they also record on their worksheet how strong and sturdy it is compared to their other shapes (for example using a star system). Polygons that hold their shape well (typically the triangle) are recorded as being the most sturdy (e.g. three stars). Polygons that easily distort and lose their shape (most of the other shapes) are recorded as being the least sturdy (e.g. one star). Students add the shapes they have built to a class chart, with names and number of sides, until all shapes built are listed for all to see. Summarize the class chart: the triangle should be the shape that most often has three stars. Other shapes will vary in their rankings, but should usually rank below the triangle. Discuss why the triangle is the strongest shape: a triangle will hold its shape even when forces are applied to it from any direction. The shape of a triangle can only be changed by changing the length of its sides, so if its sides stay rigid (do not buckle) the triangle is stable. A force on a triangle is spread around the shape, as compression (pushing forces) and tension (pulling forces), and these forces are balanced. In comparison, a force on a square or other shape with more sides can change the shape by collapsing the corners. Ask students how they might make the weak shapes stronger. If prompting is needed, ask them which was the strongest shape (triangle), then how this shape might be made within the weak shapes. Distribute five long plastic strips to each student pair at their desks. Ask students to make their original shapes, then add cross braces to reinforce the weak shapes and make them strong. Photos 3, 4 and 5 show some examples of the many possible outcomes. Ask students to retest the reinforced shapes for strength, and look for the shapes (usually triangles) that have been made from the original, larger shape. 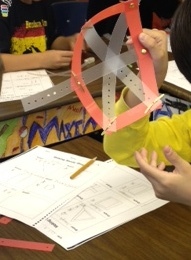 Students bring one of their reinforced shapes to a group discussion, and show the triangles that are within it. If there is any weakness in a shape still, ask students how this could be strengthened, and point out the additional triangles that are made. Look again at the images of the bridge and building. Ask students to find the shapes within the frame, noticing that many or all of the shapes are triangles. Engineers have learned that triangles are strong shapes, so build them into any large structure to keep it rigid and strong. This is really two activities, but they would always be used together, for a full lesson.